On Feb. 21, 2014, St. Mary’s baseball pitcher Matt McClain had a game for the ages, tossing a nine-inning no-hitter against Rogers State. 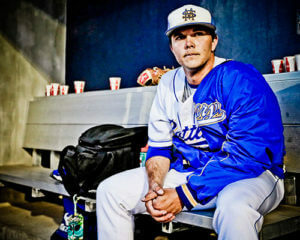 He struck out 12 in Rattler baseball’s first no hitter since the 2007 season and just the second in at least 12 years. And McClain did it with his mind somewhere other than on the baseball field. Just one month earlier, McClain’s 17-year-old sister, Maddie, was diagnosed with kidney failure. Their mother was scheduled to donate her kidney to Maddie a few days after this game in an effort to save her daughter’s life — something McClain carried with him into the outing against Rogers State. Three days later, McClain got a phone call from his father telling him to come home right away. The family had learned that a kidney from a new donor, a 13-year-old girl who died, was available. They had to act immediately, so the next morning Maddie went in for surgery. Which made the timing of McClain’s tribute performance even more special.